Note: This is one of the few products that we do not stock. So, it will take from 3 to 5 days for one of these windshields to ship. This is an adjustable windshield. It is made by Madstad Engineering and is designed to replace the stock factory windshield and provide smooth air, clean wind protection with no turbulence. Why do MadStad windshield systems work so well? Because we detach the shield from the fairing allowing it to scoop air up underneath. This eliminates the vacuum behind the shield which is what causes most of your turbulence in the first place. See the diagram below to see how this works. It also means that a small shield can deflect the air higher than a tall one so you can look over the shield and not through it, without having the wind hit you in the face. Why would you want a big piece of plastic on the front of your bike anyway? With our system there's no wondering if you bought the right height shield; you simply adjust it to your height and riding position. The MadStad system consists of a base windshield in gloss black (it replaces your factory windshield), our patented adjustable brackets that bolt to this base shield, and then the new windshield which attaches to our brackets. Your factory windshield adjustment levers will not be used, meaning that once you attach our base shield in place of your stock shield, it will simply sit in the lowest position. Height (and now also angle) adjustments are made on our brackets. These windshields are available in three different heights and six different colors. Be sure to select the correct combination when ordering. The chart below is a guideline based on the height of the rider. This will fit all Honda F6B's from 2013-2017. For riders 5'7"-5'9" we recommend a 12" shield. For riders 5'10"-6'0" we recommend a 14" shield. Clear and Light Gray - These are pretty close to each other. The Light Gray has just a small amount of tint to cut down on glare and reflections a little bit, but you still have near total visibility at night. It is a subtle amount of tint and does not add much color accent to the bike. Medium Gray and Bronze Smoke - These do add color to the bike but you can see through them pretty well during the day, just like looking through an average pair of sunglasses. You can also see through them at night although it's noticeably darker. Keep in mind that with our system properly adjusted, 95% of your view is over the top of the shield anyway. Medium Gray is simply a shade of black and goes with just about any bike because they all have black somewhere. The Bronze Smoke has a bit of a brownish/orange tint so it goes well with bike colors like yellow, orange, brown and sometimes green. Dark Gray is a dark charcoal color and it looks great with black bikes especially. The version we provide for Harleys specifically is an extra dark gray (X-Dark) which is the darkest shade we can get and still be able to see through it. You can see through either dark gray in daylight but at night but it is pretty dark, like looking through dark sunglasses. Again, 95% of your view is over the top of the shield but some people are distracted by a dark shield in front of them, and if you have night vision problems we would definitely not recommend this color. The MADSTAD adjustable windshield system is an unprecedented innovation that eliminates turbulence by allowing air to come in beneath the shield with full control over the windshield position and airflow . This patented design evolution results in a smooth, quiet ride not achievable with a fixed windshield. 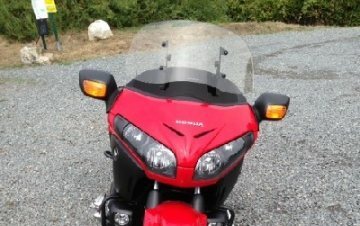 Because the windshield can be adjusted for height and angle the system adapts to any rider, regardless of height or riding position. Finally, motorcycle enthusiasts everywhere can experience highway speeds with visor open, plain sunglasses on while looking well over the top of a small shield with nothing but a light flutter of fresh air on the face. Now that's riding! MADSTAD windshield systems may cost more than others but, why waste any money on shields that don't work? Q: How do I set the angle on my MADSTAD system? Our windshields work best at approximately a 60 degree angle relative to the ground, give or take a few degrees. On the back cover of the user manual you will find an angle guide to help you align your shield. (Several smartphone angle finder apps are available that you can download.) Your personal best comfort level will likely be between 55 and 63 degrees, you will have to experiment a bit to find out what works best for you. Q: Why does MADSTAD use Cast Acrylic instead of Polycarbonate plastic? Cast acrylic is more rigid, more optically clear, has better scratch resistance, better chemical resistance for cleaning, easier to mold, less costly, and does not cloud or become hazy over time like polycarbonate can. We use a minimum 3/16" (4.5 mm) thick cast acrylic to make all of our windshields so they are nice and rigid, super-clear and easy to maintain. FYI, the canopy of the F/A-18 Hornet supersonic combat jet is made of cast acrylic. If acrylic is good enough for a military fighter jet it should be good enough for your motorcycle! Q: What should I use to clean my MADSTAD windshield? You can use just about any standard windshield cleaner on our cast acrylic shields, but avoid any product that contains alcohol. To remove sticky bugs and tar we've used orange-oil based cleaners like Goo-Gone, Citrus Cleaner or similar, and Meguiar's PlastX which both cleans and polishes out light scratches. You can get that stuff at most auto parts stores like Advance Auto Parts or AutoZone (in the car polishes section). After cleaning, if you want the ultimate shine we would recommend All Kleer as the final step (the version made for motorcycles). ANTI-RAIN: Rain-X is NOT recommended for use on our shields because it contains alcohol. There is another product called RejeX Polymer Sealant that is recommended for acrylics, so use that instead. It is available online.